Winners in Melbourne in 2006, India once again underlined its liking for Australia; on the evening of Monday 9th April, the trio comprising Sharath Kamal Achanta, Sathiyan Gnanasekaran and Harmeet Desai combined to win the Men’s Team title at the Gold Coast 2018 Commonwealth Games in the splendid setting of the Oxenford Studies. At the final hurdle they beat the Nigerian trio formed by Bode Abiodun, Segun Toriola and Olajide Omotayo by three matches to nil. A somewhat tentative start from Sharath Kamal Achanta against Bode Abiodun but from the start of the second game, more positive, he assumed control of the game. The second and third games both secured with a degree of comfort, in the fourth he established a 7-5 lead; Bode Abiodun called “Time Out”. The break did not stem the tide, at 10-7, Sharath Kamal Achanta held three match points; Bode Abiodun won the next two points, Massimo Costantini called “Time Out”, the pause worked, Sharath Kamal Achanta punched the air, India held the early lead. Advantage India, a highly motivated Sathiyan Gnanasekaran entered the arena, after losing the opening game against Segun Toriola, one in which had held a 10-6 lead, he moved into a totally new gear. He was just too fast for his worthy opponent, he forced Segun Toriola into the passive role, a four games win was secured (10-12, 11-3, 11-3, 11-4). 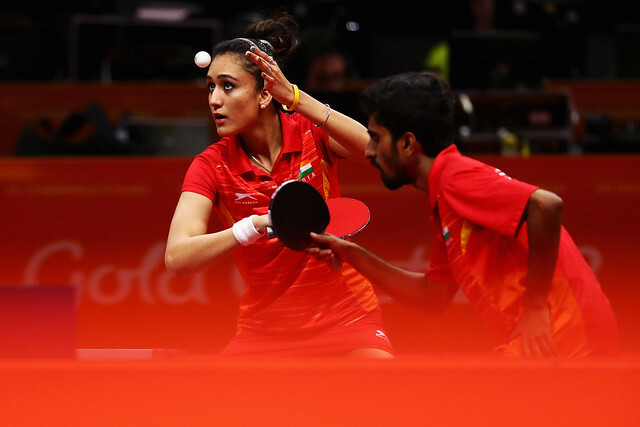 Two matches to nil ahead, the momentum was now with India; Sathiyan Gnanasekaran returned to the arena to partner Harmeet Desai. Nigeria changed from earlier selections, Olajide Omotayo joined forces with Bode Abiodun. Whatever the combination the die was cast, Harmeet Desai and Sathiyan Gnanasekaran established control and maintained control, a straight games win was recorded (11-8, 11-5, 11-3). Once again as the previous evening when their female compatriots has emerged successful, the top step of the podium belonged to India.